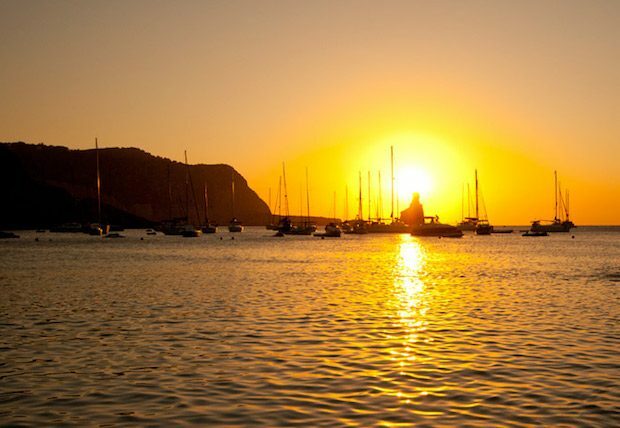 Here we give you our pick of the best 5 sunset locations in Ibiza. Of course there are others and we would love to hear about your favourite sunset spots in the comments below with your best photos if you have any. 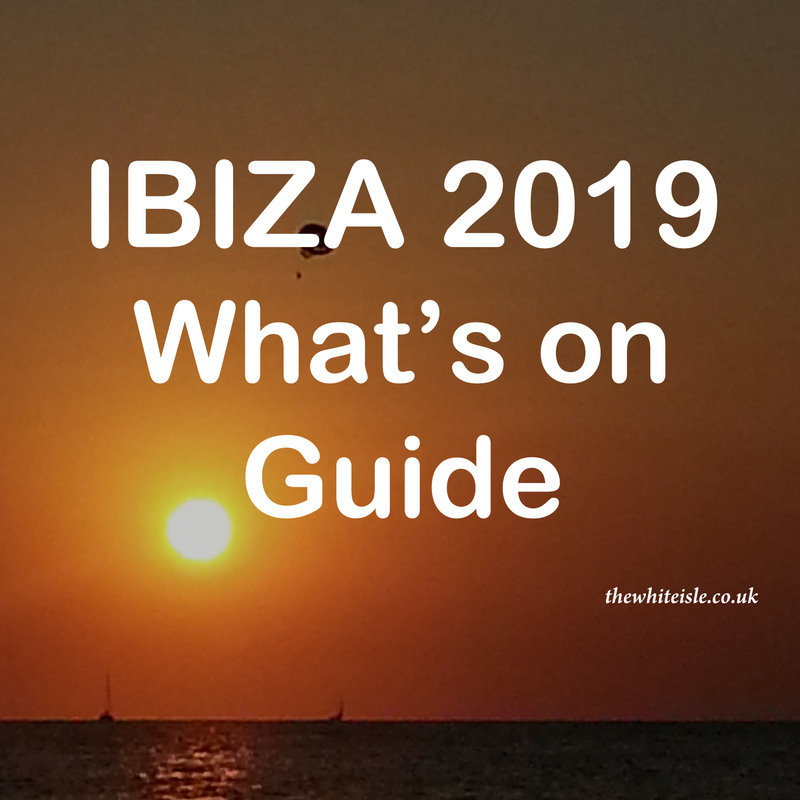 The most famous of all the sunset locations in Ibiza is the Sunset Strip – a collection of bars with uninterrupted views across the mediterranean of the sun descending each evening. 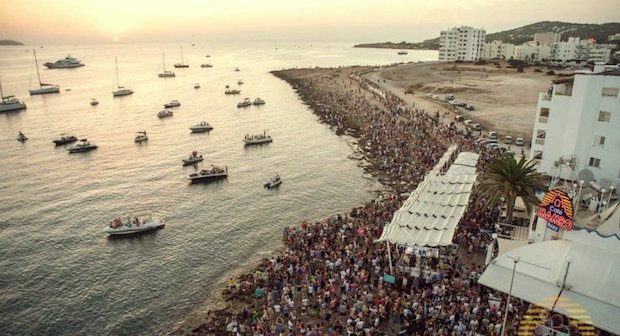 With top flight DJ’s and pre parties being held here each evening at Cafe Mambo, Cafe del Mar, Savannah & Mint Lounge alongside thousands of people watching from the rocks beside the bars, the atmosphere is incredible, with all ages joining together to watch the spectacle. For those who like it a little more relaxed but still convenient you will find a little further on from the rocks some of the quieter bars who still have the amazing sunset view such as Bamboo, Kayna, Kasbah and Golden Buddha but with less of the crowds. 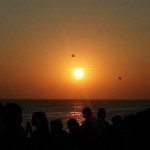 Every evening this is a special sunset with the sun going down behind God’s Finger (a piece of rock jutting out of the sea) but on Sunday evenings local drummers perform as the sun slips away beneath the horizon. An experience not to be missed. Born from an anti war protest in the early 90s the tradition continues on Sundays and in peak season thousands join them in a rhythmic celebration of the sun setting. 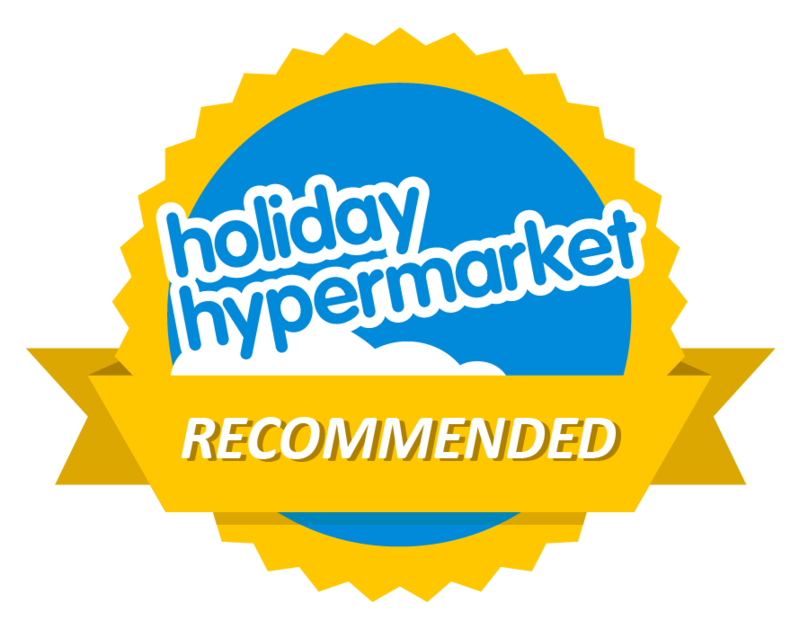 Our advice is take a boat trip to experience it as parking especially in the peak of summer is chaotic. Boats go from San Antonio, San Miguel and Portinatx. 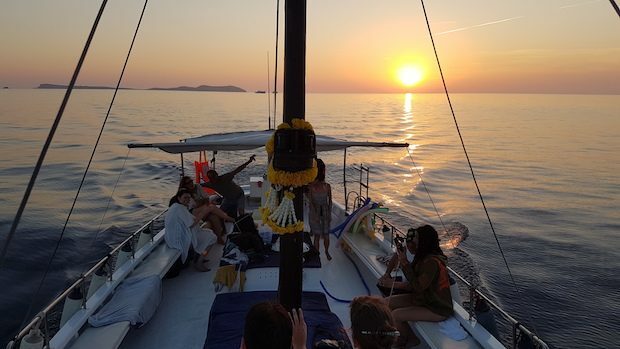 This is by far our favourite way to celebrate the sunset, out on the open sea away from all the crowds with just you and your sailing companions for company. With the waves lapping at the hull of your boat, gently bobbing around with totally uninterrupted views of the sun sinking below the horizon is a magical and special moment. Take the time to toast mother nature as her natural display leaves you in awe and gives you a view that will last in your memories for a lifetime. There are many ways to experience the sunset from the sea but our recommendation would be with Chilli Pepper Charters who sail daily from San Antonio. Es Vedra is the mythical and magical rock of Ibiza which sits just off the west coast of the island and is the 3rd magnetic piece of rock in the world. The sunset overlooking Es Vedra is a sight to behold be it from the cliffs or from higher ground beside the Pirate Tower. I would go as far to say it is a spiritual experience with just you the view and your thoughts for company. Please be aware a little off road driving and a short walk is required to get to the cliffs overlooking Es Vedra and to get to the Pirate Tower there is an additional steeper walk. Sunset Ashram is a beach side restaurant overlooking the beach at Cala Conta and for those looking for a great place to eat and drink and to enjoy an unspoilt view of the sun setting. 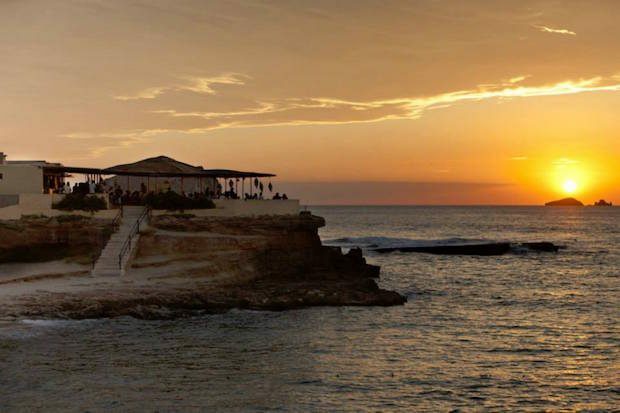 With a bohemian crowd and musical accompaniment it makes for yet another magical location in Ibiza to watch the sunset. Due to its remote location a car / taxi is required to get to and from Sunset Ashram but it is well worth the journey. 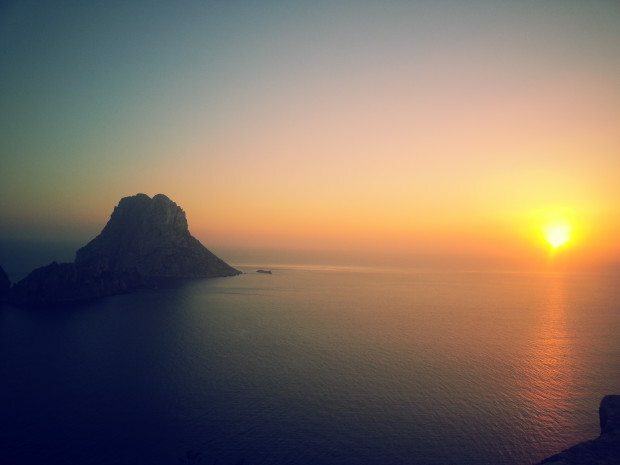 These are our Top 5 Sunset Spots in Ibiza and we would love to find out your hidden spots too. Please comment and post your pictures below. And to help you make sure you don’t miss the sunset we have the latest sunset times here all year round. Our handy map of both this our Top 5 Sunset Spots in Ibiza and our 5 More Sunset Spots in Ibiza. Ah, I’m so glad I found this article! I’m going to an Ibiza hen do soon and one of the things I just have to see is the famous Ibiza sunset. I’m glad it’s so easily available and a late night cruise on a boat to see it sounds heavenly! I’ve heard that the best sunsets on the island are from Hostal LA Torre. Another gem owned by Javier, the Mambo icon. Not been there yet but will visit it this summer! They are amazing high up on the cliffs and from Cap Negret beside the hostal. Not the easiest place to get to (taxi or car required) and in peak season it can become very busy with guests. Yes, it should definitely have been on this list. you don’t want to do ‘spends’, there’s an observation point nearby – roadside. Get there early.